I woke up this morning feeling as grey as the day. 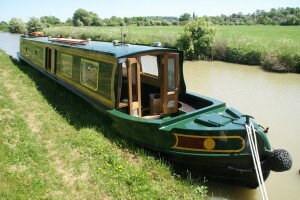 I’m often like this when I’ve come back from a trip on our narrow boat, the Molly May. There’s something special about slowing down the pace of life to three miles an hour, and passing a clutch of new-born ducklings scuttling over the water towards their anxiously protective mother. We counted 14 in one brood. That would have involved a lot of hard work. As soon as she lays her last egg, the female duck settles on the nest for 28 days. She rarely leaves the nest during this time, and she turns the eggs regularly during incubation to make sure each one maintains the right temperature to finally hatch. Within a few hours, they all hatch on the same day. Ten hours later, normally early in the morning, the mother leads her brood to water. A couple of years ago, I witnessed this miracle of nature first hand. Giselda, our 18 month-old Appleyard duck, produced nine eggs under the laurel bush, and nestled in for the duration. Harold, her testosterone-fuelled partner, having spent a lot of time amorously and very persisently pursuing Giselda in our very small pond, strutted around the garden, threatening the cats, the hens, and ourselves if we dared to come near. Finally, 28 days were marked off the calendar, and shooing a disgruntled Harold away, I sat down nearby to see what would happen. Soon, I heard the first cheep, and saw a tiny yellow beak appearing from under Giselda’s mighty breast. Then another one appeared, and sure enough, within a short space of time, the rest of the ducklings had hatched. I put out a basin of water for them, and that afternoon, found the ducklings swimming around in it – just like bright yellow rubber ducks you buy for the bath – with Giselda proudly watching over them. Harold, however, was extremely put out that Giselda no longer had time for him. He harrumphed around the garden, stabbing anything he could with his beak, chasing after our two terrified cats, and taking a run at our ankles every time we stepped onto the lawn.This carried on for a couple of weeks until Harold had had enough of his offspring, and tried to kill them. Of course, in the wild, Harold would probably have been mating with other female ducks, and therefore wouldn’t have been so aggressive. Now, however, he ended up in a separate pen, glowering in cold rage as Giselda and her brood took to the pond, which they proceeded to trash. Ducklings are unquestionably heart-melting. But they are also eating machines, and grow at alarming rate. 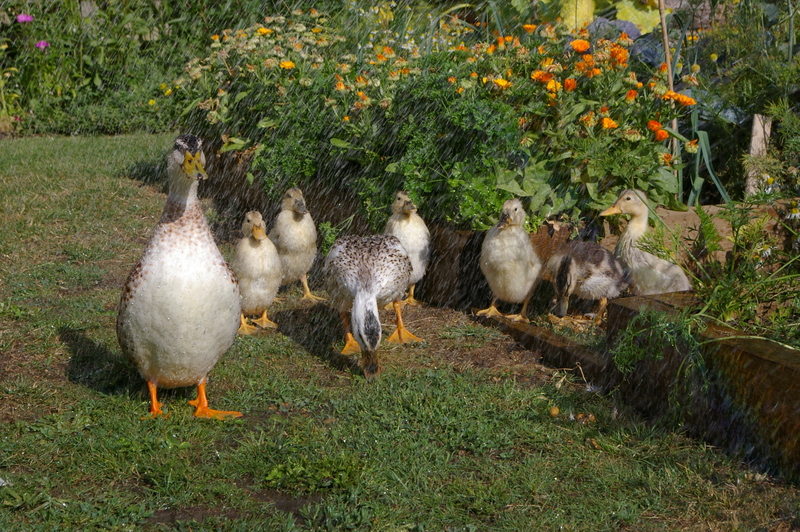 Each day my vegetables and flowers were stripped to where the ducklings could jump up to. Needless to say, that year we were left with nothing. To save our garden, sadly, the ducklings had to go. Soon after, we found a new, more suitable home for Giselda and Harold, on a mill pond. I still miss them. But they left me with a clear understanding of how well-defined the roles of male and female are in the natural world. Of course, we humans have evolved far beyond this, or so we think. But, sometimes, particularly since reaching post-menopause, I seriously wonder that if men and women’s relationships were more like Griselda and Harold’s, the world would be a less fractious place. Then again, all male species fight each other for the right to mate with the female of their choice, or to gain territory for offspring to thrive. No matter how sophisticated we believe we have become, we are all driven by these same basic instincts. But, spending time on the narrow boat helps to slow me down, and reminds me that the natural order of things is really very simple. We are born. We live. Then we die. But, my goodness, what tangled webs we all weave. Realising this makes me stop ‘doing’, and just enjoy the moment for what it is. Even so, this longed-for peace can be bitter-sweet. When I get home, I know I will experience a deep sadness for the uncomplicated life that drifting along on the Molly May gives me. But my computer awaits, and my dairy fills, and off I go again. This entry was posted in All posts, Menopause and ageing and tagged ducks, Kate Boats, Molly May, post menopause. Bookmark the permalink. ← The Royal Wedding and the death of bin Laden. What’s next? A great tale of ducks, yet not a mention of making new friends on the cut!